With so many new series popping up on streaming services and DVD every day, it gets harder and harder to keep up with new shows, much less the all-time classics. With TV Club 10, we point you toward the 10 episodes that best represent a TV series, classic or modern. If you watch those 10, you’ll have a better idea of what that series was about, without having to watch the whole thing. These are not meant to be the 10 best episodes, but rather the 10 most representative episodes. Thanks to the Internet’s unavoidable onslaught of ’90s nostalgia, Nickelodeon’s “Nicktoon” programming has seen a massive resurgence in popularity lately. Shows like Doug, Rugrats, Rocko’s Modern Life, and Aaahh!!! Real Monsters have found a second life online for twentysomethings reliving their childhoods, as well as those who weren’t alive for their premières but can still appreciate a good splat noise. But nostalgia’s a tricky thing. Pogs might have a thousand Tumblr tributes now, but no one’s clamoring to play the game again, because ultimately, it wasn’t any good. While nostalgia can earn something a second look, only quality can guarantee a second life. In this respect, children’s programming walks a tricky line. The only children’s shows that achieve any sort of longevity are those that entertain both children and weary parents by weaving in equal parts screwball hilarity and double-take adult jokes. These are the children’s shows that become beloved, reclaiming their place in viewers’ hearts years after they went off the air or became a series of horrifying plush dolls. While shows like Rugrats and Doug are widely acknowledged as deserving of intergenerational praise, fellow Nicktoon Hey Arnold! has largely flown under the nostalgia radar. Hey Arnold! quietly broke new ground for sophistication in children’s cartoons by maintaining a steady balance of high jinks and heart. It’s hardly surprising that creator Craig Bartlett first worked on shows that prioritized entertaining viewers of all ages, first as an animator on Pee-wee’s Playhouse, then as a story editor on Rugrats. Bartlett came up with the idea for football-headed Arnold while at Pee-wee and made some Arnold-centric shorts. It was only after Bartlett’s time on Rugrats, though, that Hey Arnold! found life as a series on Nickelodeon in 1996. Arnold’s fourth-grade class contains a variety of elementary-school archetypes: Eugene the Loser, Rhonda the Rich Girl, Sid the Snitch, and so on. Some of these archetypes veer toward stereotype, as with Teacher’s Pet Phoebe (who’s of Asian descent) and Village Idiot Stinky (who speaks with an exaggerated Southern drawl). But as the series progressed, all of the characters got their own episodes and nuances that took them far beyond their original two-dimensional purposes. This holds especially true for breakout character Helga G. Pataki (voiced to impish perfection by Francesca Marie Smith), who was so popular that she almost got her own spinoff series after Hey Arnold! ended. Helga, P.S. 118’s scoffing schoolyard bully, torments Arnold so she can hide her secret obsession with him. One of the most impressive aspects of Hey Arnold! is how committed it was to fleshing out its adult characters. Arnold’s elders are a far cry from Charlie Brown’s whomp whomp-ing teachers. In fact, the adults of Hey Arnold! have actual adult problems, ranging from depression to unemployment to alienation from their own families. Seemingly peripheral characters like the postman, the florist, the butcher, and the tenants of the boarding house owned by Arnold’s grandparents gain depth as the series progresses. Some of these issues get their own episodes, but others are subtler, recurring in the background or in jokes kids might miss. Arnold’s grandma, for instance, is an eccentric prone to mixing up the holidays, cooking the same cobbler for weeks on end, and adopting new identities every day. Grandma’s quirks are often played for comedy, but it’s clear upon revisiting Hey Arnold! as an adult that many of them stem from advanced dementia. While the show was named for a single football-headed boy, Arnold ultimately became the lynchpin in a rich, heartfelt community. It was just a bonus that his series was also sharp, self-referential, and flat-out funny. Here are 10 episodes that demonstrate those qualities. “Downtown As Fruits” (season one, episode one): In a refreshing twist, Hey Arnold’s pilot is exemplary of the series’ strengths. Arnold and Gerald ditch their school musical on food groups, only to get caught up in a series of downtown misadventures, which are only complicated by the fact that they’re dressed as a banana and a strawberry. Meanwhile, an immediately terrifying Helga tries to keep the play together while simultaneously wrestling with her feelings for the missing Arnold. Throw in several jokes no kid would reasonably understand, and “Downtown As Fruits” is the perfect primer for why Hey Arnold! has aged so well. “Stoop Kid” (season one, episode 16): Some of the most satisfying episodes of Hey Arnold! weave Arnold’s adolescence with the city’s own growth process. This happens mostly through local urban legends as told by Gerald, the show’s perennial “keeper of the legends.” These stories of ghouls and shadows and neighborhood superheroes are interesting in their own right, but are more impressive when the show peels them back to reveal the person hiding just beneath. The so-called “Stoop Kid” of the episode’s title may seem like a glowering neighborhood staple, but just beneath, he’s actually an ornery kid whose fear of the world keeps him confined to his stoop until Arnold makes it his mission to help. “Stoop Kid” neatly ties several recurring threads together: the urban legend, its pathos, and Arnold approaching it with his signature compassion. “Helga’s Makeover” (season one, episode 19): If Arnold is the show’s moral compass, Helga G. Pataki is its center of chaos. She spends half her time storming through her classmates and the other half huddled behind a trashcan, reciting surprisingly eloquent confessions of love to Arnold from afar. The show devotes considerable time to fleshing her out and showing that, while Helga’s bullying is a defense mechanism, her unapologetic brashness is an intrinsic part of her character. “Helga’s Makeover” tackles this head-on, following Helga’s frustration when she’s shunned from both an all-girls sleepover and an all-boys baseball game. The titular makeover that follows is a series of unfortunate and gendered events that make for a great character study of Hey Arnold’s female lead, as well as an impressively nuanced episode about the pressures of growing up as a girl. 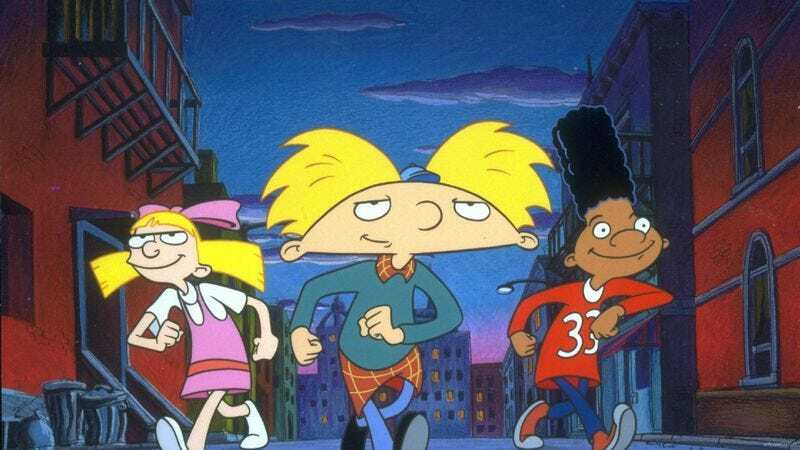 “Das Subway” (season one, episode 25): The closest thing Hey Arnold! has to a bottle episode, “Das Subway” does a twist on the classic “characters get stuck in an elevator” trope by trapping Arnold and his friends in the bowels of the subway. As they and a motley crew of adults panic, Arnold’s grandma assumes a particularly fun new identity to rescue them. It’s a fun, tightly paced episode that displays remarkable confidence. Even at this early stage, the show believed that we know the characters well enough to have fun watching them bounce off each other (literally and figuratively) in a single subway car—and was right. “Four-Eyed Jack” (season two, episode 32): The story of ill-fated scientist Jack has a key difference from Hey Arnold’s usual urban legends: Grandpa, rather than Gerald, is the keeper of this particular legend. This allows Gerald to assume the role of the skeptic, as Arnold insists on embarking upon a ghost hunt around the boarding house so the two can find Four-Eyed Jack and make sure he’s at peace. This story neatly summarizes Arnold and Gerald’s friendship: Arnold believes in the inherent magic of people, while Gerald indulges him with a shake of his head and a smile. As they make their way around the creaky house, the ghost hunt also becomes a parade of the house tenants’ various peculiarities, giving new viewers a handy introduction to Arnold’s makeshift family. “What’s Opera, Arnold?” (season two, episode 34): As the characters spend more than half of this episode singing, “What’s Opera, Arnold?” isn’t necessarily representative of the series so much as representative of the show’s willingness to experiment. Arnold’s class takes a field trip to the opera, which the show at least acknowledges is a hilarious choice for a pack of hyperactive school kids by immediately having both Arnold and Helga fall asleep. The pair’s active imaginations go into overdrive as they dream themselves into the opera in the style of the Bugs Bunny classic “What’s Opera, Doc?” Arnold and Helga’s 9-year-old interpretations of some of opera’s most famous arias are alternately hilarious and revealing of their characters. Musical episodes might be par for the course now, but at the very least, “What’s Opera, Arnold?” has the impressive distinction of being only 11 minutes long. “Helga Blabs It All” (season three, episode one): Helga’s desperation to keep secret her love for Arnold is a constant presence in Hey Arnold!, and it’s never funnier than when she’s on the precipice of completely blowing everything, as she is in “Helga Blabs It All.” The dilemma: Helga leaves Arnold a melodramatic confession on his answering machine while under the influence of laughing gas. The solution: Infiltrate the boarding house and grab the tape before he can hear it. Helga sneaks into the boarding house in several episodes, but the comedy of errors in “Helga Blabs It All” makes this one the strongest. Helga is a master of physical comedy, between her stomping, her punching, and her falling all over herself. Her do-or-die mission in “Helga Blabs It All” is that slapstick’s perfect showcase. “Arnold’s Thanksgiving” (season three, episode 27): Arnold’s unconventional living situation is an accepted fact of the series. There are occasional references to his long-lost adventurer parents, but for the most part, Arnold is committed to his grandparents, their collection of misfit tenants, and his pig Abner as a makeshift family. There is no question that everyone in the Sunset Arms boarding house has come to depend on each other as any family would, even if they came together by accident. Still, Arnold feels the pangs of wanting to be “normal,” as any 9-year-old would, so when the boarding house readies itself for Grandma to turn yet another Thanksgiving into the Fourth Of July (a yearly tradition in forgetfulness), Arnold decides he’s had enough. His pursuit of the perfect, traditional Thanksgiving has him running into Helga (also on the run from her deeply dysfunctional family) and crashing dinner at their teacher’s house. Arnold comes to realize that there is no such thing as a “normal” Thanksgiving, as was inevitable. This lovely, quieter episode tackles one of the series’ more consistent, yet subtle themes: disappointment. “The Flood” (season three, episode 29): Arnold’s most defining characteristic (besides his head shape) is his persistent belief that everyone is basically good, and that solving problems is as easy as encouraging people to work together. In “The Flood,” a flash flood strands Arnold’s entire class at school with painfully earnest teacher Mr. Simmons, whose constant affirmations that the students are all “really, truly special” mean nothing as the water rises around them. The class briefly plunges into anarchy, before Arnold makes them come to their senses. This is an arc that pops up time and time again throughout Hey Arnold!, but “The Flood” has the added benefit of both a sharp Grandpa subplot and a runner about the school principal’s dwindling sanity (which becomes all too familiar throughout the series, in a Dean Pelton kind of way). “Helga On The Couch” (season four, episode 16): Most cartoons exist with a nebulous sense of time. Characters develop, but their ages and personalities usually stay the same. If there are any major developments, a reset button is never far behind. But after four seasons of Helga struggling through her family issues, bullying instincts, and feelings for Arnold, the series took a sharp left turn by having an adult take her insecurity seriously—in this case, a child psychologist. Much of the episode takes place in her office or in Helga’s flashbacks. While it may seem strange to end a list of essential Hey Arnold! episodes with one that’s Helga-centric, “Helga On The Couch” displays the series’ strengths in several crucial ways. It peels back the layers that the show spent seasons developing, showing how Helga was never simply a playground tyrant. She was a girl whose neglectful family always made her feel invisible, so she adapted. It’s a satisfying look at Helga’s backstory, and it even manages to weave in the reason why Arnold’s empathy is so important to those around him, whether he knows it or not. And if you like those, here are 10 more: “Vacant Lot” (season one, episode six); “Heat” (season one, episode 17); “Wheezin’ Ed,” (season one, episode 26); “Pigeon Man” (season one, episode 28) “Arnold’s Christmas” (season one, episode 35); “Longest Monday” (season two, episode seven); “Big Caesar” (season two, episode 10); “Girl Trouble” (season three, episode 36); “Back To School” (season four, episode one); “Buses, Bikes, And Subways (season four, episode 19). Availability: All 200-plus episodes of Hey Arnold! are currently available for instant streaming on Netflix (though the episodes are not in the order they aired), as well as the Hey Arnold! movie. Episodes are also available for purchase on Amazon Instant Video. Shout! Factory has issued DVD sets of the first two seasons of the series; the third will see release on January 29. Next week: Genevieve Koski finds the 10 perfect episodes for one of the great blue-collar sitcoms of all time, Roseanne.